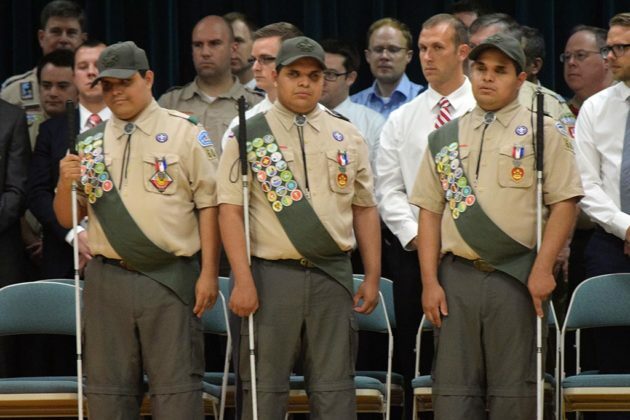 (Updated 12 p.m.) As elementary school students, blind triplets Leo, Nick and Steven Cantos were bullied, had few friends and no role models. 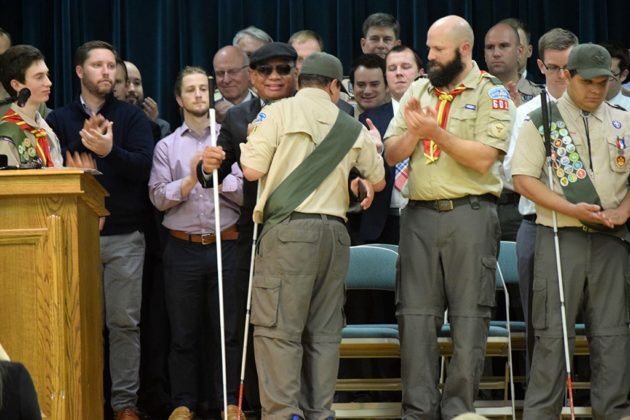 But that changed when, at the age of 10, blind attorney and Crystal City resident Ollie Cantos became their mentor after learning about them through a friend at church. He legally adopted them two years ago, and turned their lives around. A ceremony on Wednesday night marked how far they have come, having also graduated from Wakefield High School earlier this year. 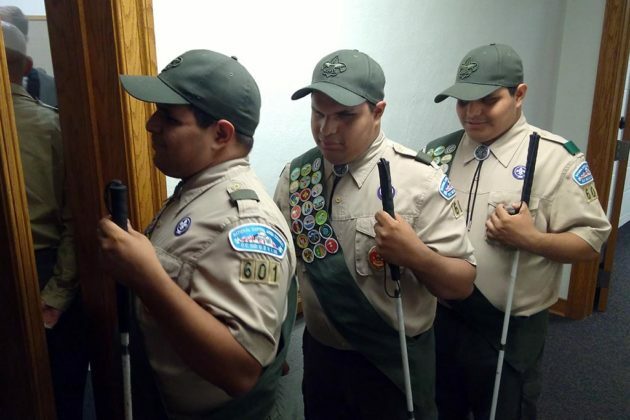 At The Church of Jesus Christ of Latter-day Saints in Alexandria, the brothers became the first ever blind triplets to be honored as Eagle Scouts in the history of Boy Scouts of America. 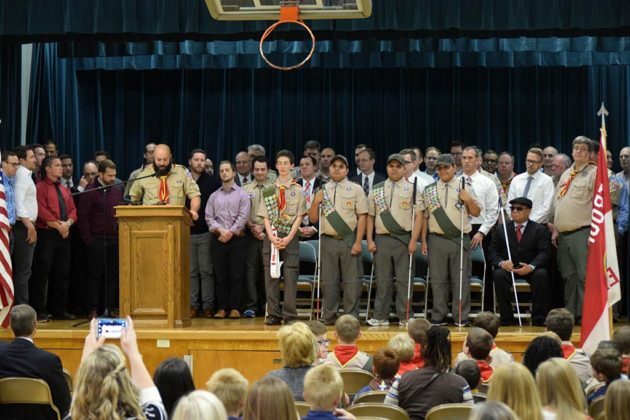 To become Eagle Scouts, the highest honor in scouting, candidates must complete a slew of assignments, including tasks like first aid, knot-tying, leadership and orientation. 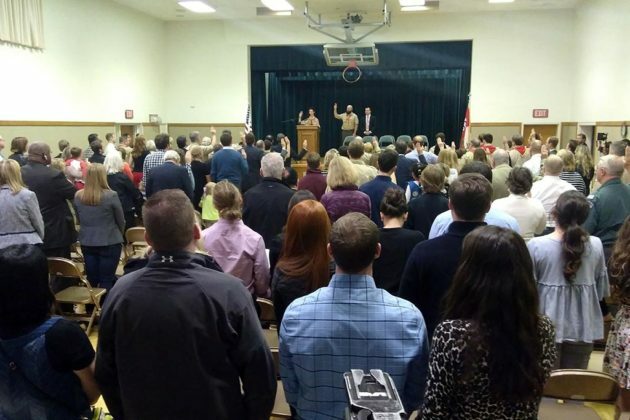 It also requires community service, and six months or more spent in leadership positions at their troop. Each also had to lead a community service project. Steven Cantos collected school supplies for low-income schoolchildren for nonprofit Aspire! Afterschool. He already volunteered with the organization, which helps children improve their reading, and had intended to collect enough supplies for 90 students. When the supply drive was over, he had collected enough for 130 students. Leo Cantos collected blood and blankets for INOVA Fairfax Hospital, a children’s hospital where he spent a month re-learning how to walk. He finished with 88 units of blood and 77 blankets, all donated by local people he had recruited. And Nick Cantos collected donations of hygiene supplies for nonprofit Doorways for Women and Families, which helps people out of homelessness and away from domestic violence and sexual assault. He collected about $2,000 worth of supplies to donate to the organization. 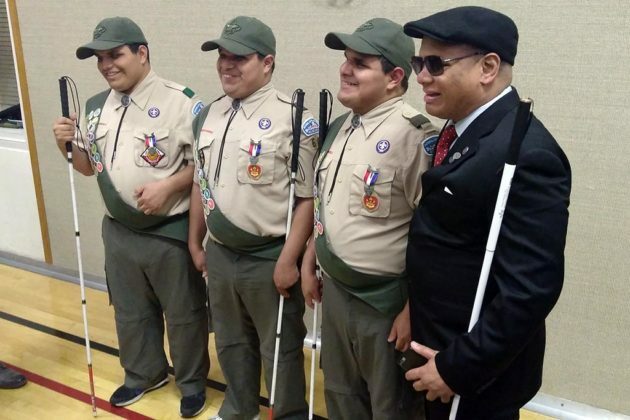 And while they could have gotten extended time to complete their requirements to be Eagle Scouts due to their blindness, they chose not to. Ollie Cantos said that decision was made to show that being blind does not need to be a hindrance. One of the biggest challenges for the brothers was the swimming requirement, as none of them had spent much time in the water before. But in the summer of 2014, they were all able to dive in, swim to a target with the aid of voice assistance and then swim back. All the while, they were cheered on by their fellow scouts and leaders at poolside. With the brothers now graduated from high school, they will go to Boston in about six months to learn further life skills so they can become more independent. All three have ambitions to go to college. Steven wants to study political science, go to law school and study copyright law and intellectual property rights; Nick wants to study marketing and go into the real estate industry; and Leo wants to study political science also before specializing in cyber law and working to make technology accessible to all. 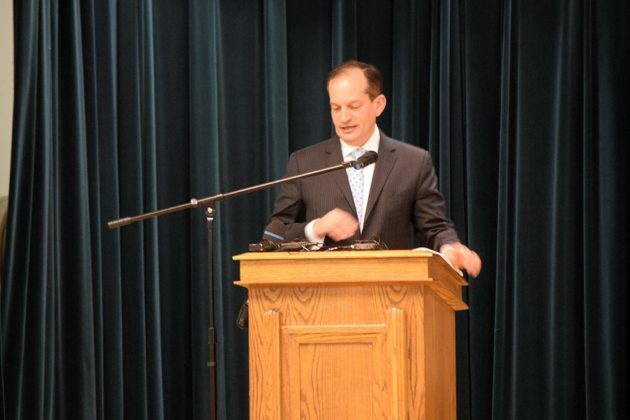 With all they have achieved already, U.S. Labor Secretary Alex Acosta, who worked with Ollie Cantos at the U.S. Department of Justice, said their futures look bright. 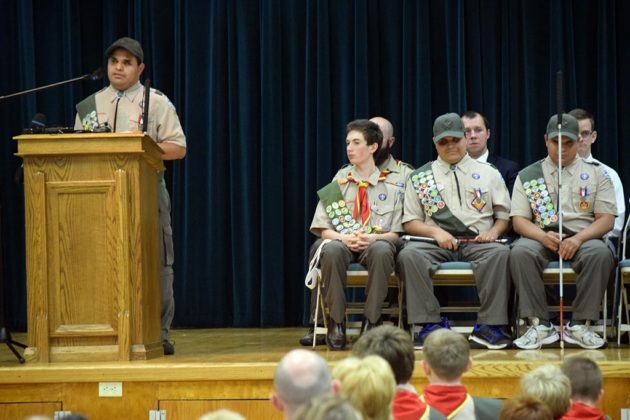 “There is no stopping you, and a large part of that is you, but a greater part of that is your family,” said Acosta, who was among the crowd of around 100 family members, Scouts and well-wishers at the ceremony.